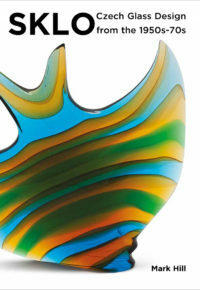 You can read the first five of my ‘Top Ten’ of personal favourites in 20th century glass by clicking here. You’ll see I focused on five pieces from different British designers, but the final five come from overseas. Our first destination is Denmark, home to the world-famous Holmegaard factory. The design I have chosen is the ‘Duckling’ vase (left), designed by the notable Per Lütken in 1950. Looking at the rim, it’s easy to see how it got its name! 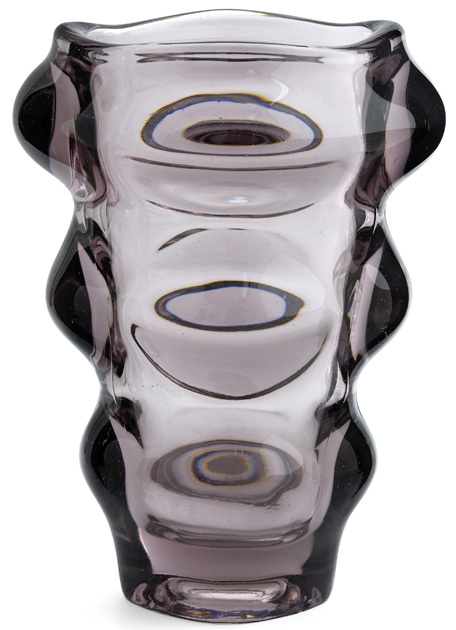 To me, it’s a classic, representing a number of key themes in 1950s Scandinavian glass. The ‘Duckling’ is all about curves – both inside and outside. Without wanting to state the obvious, unlike ceramic, glass allows you to see inside a form. The optical effects created by the interaction of the inside and outside here are a key part of the design. The shape itself was derived from the forms of flower and leaf buds seen in nature, which was a constant source of inspiration for Scandinavian designers. Of course, very little in nature is even and symmetrical, and the asymmetrical form both harks back to this inspiration again, but also perfectly reflects 1950s tastes. Think of tables in the form of artist’s palettes, kidney shapes and even the rims on Beswick bowls. Asymmetry unites them all. The theme of nature is also followed through into the choice of colour. The cool, classical ice blue example shown here is typical and recalls icy streams. Other colours include a stronger blue and a fern-like green. The design works best when there are no scratches or lime lines from water. These detract from the purity of the colour and lines. Similarly, watch out for factory glitches, like bubbles. Quality control at Holmegaard was extremely high and anything that didn’t make the grade was seconded. Although the Duckling was produced from the 1950s-70s, inscribed marks on the base didn’t bear Lütken’s ‘PL’ monogram after 1961. Sizes range from around 5in (12.5cm) upwards, and values depend on size, ranging from £20-30 to over £150. Moving away from chilly Scandinavia down to the warmer climes – and colours – of the Mediterranean, we land on Murano. The importance of the innovation and creative output of this historic island from the 1950s onwards cannot be under-estimated. With so much to choose from, it could be impossible to select one design. However, I’m often asked what I think will be a ‘good bet for the future’. Of course, it’s impossible to say for sure, but one glassmaker whose work I do believe in is Vittorio Ferro. His work, which has been included in many important exhibitions, isn’t cheap and starts at around £400-600 or so, and rises to over £3,000. However, unlike those of many of his contemporaries, prices on the secondary market are incredibly strong – sometimes rising above the original retail price at auctions in Germany. Watch this one, as I believe Ferro’s star is sure to rise yet further. Moving north, we find ourselves in Czechoslovakia, previously known as Bohemia. Regular readers will know my feelings about Czech post war glass, and I have selected just two pieces to be part of my ‘Top Ten’. The first is a bottle vase like no other (left). 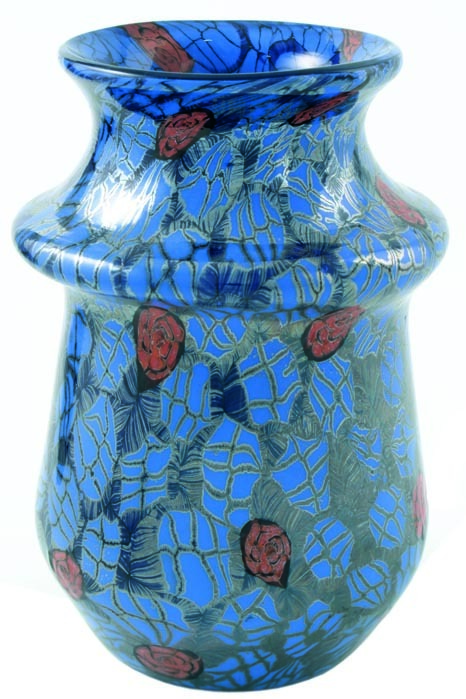 Bohemia has been known for its finest quality cut, colour cased and enamelled glass for centuries. 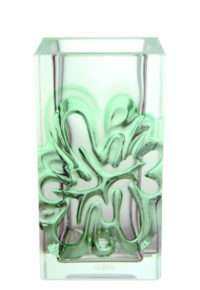 After WWII, Czech glass designs underwent a transformation, moving yet further into the modern age. 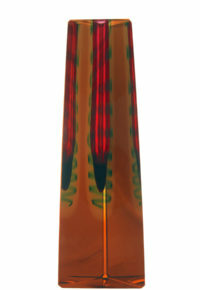 This bottle is a bridge between the traditional and the post war modern, and was part of a limited production range designed by factory manager Jaroslav Lebeda and exhibited at the landmark Brussels International Exposition in 1958. The hard to achieve white-over-red casing is cut through, harking back to traditional Bohemian glass, as do the enamelled and gilded designs. However, all have been brought forward, becoming starkly modern. The many complex cuts of old are replaced by simple, sweeping curves that echo the elegant, clean-lined bottle shape. Traditional natural or heraldic enamelled and gilded designs are replaced by modern motifs that could have come from the brush of Picasso or Mondrian. This is an interesting point – the Communist regime had banned modern abstract art that didn’t represent the political ideology of Communism. In order to practise it, many artists had to move into glass, where greater freedoms could be found. This example is the exception from my rule about my choices being affordable. Although I was lucky enough to find this piece for £10, it has a large crack running right through it. These designs are very rare, particularly in this elegant and large form, and a perfect example could easily fetch over £2,000. I think that this is just the start as the market opens up and demand exceeds supply. The country was also known for its pressed glass. Designs broke from tradition again and, rather than imitating more expensive cut glass, became more sculptural and abstract. They also focused on the optical effects of glass itself. My penultimate choice is the no.20047 ‘Egg’ vase, designed by Frantisek Vìzner in 1962 (right). Vìzner is one of the country’s most notable and important glass designers, and his studio works fetch many thousands of pounds today. 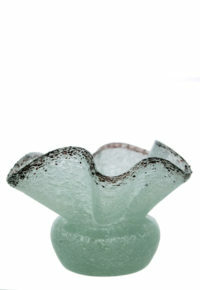 ‘Egg’ vases were mass-produced, bringing art glass into the homes of many. If you’re lucky, you can find one for as little as £30 or so, as not everyone knows what they are yet. But a more realistic price is anything from £150-200. Either price for a piece of glass that is typical of a style revolution, almost seems like a piece of sculpture (you just want to stroke its curves!) and is by an acknowledged master, seems like a bargain to me. My final choice is based on my belief that antiques and collectables should be used for the function they were made for. As I finish this article, I’m opening a bottle of my favourite tipple, a chilled white burgundy. Nothing makes this wine taste more delicious than drinking it out of a Dartington Glass ‘Sharon’ wine glass (left). Designed by Frank Thrower in 1970, and chosen by Sir Terence Conran as one of his 100 best-ever designs in 1981, its popularity has endured and it is still produced today, and costs from £5-35 depending on where you buy and whether it’s new or second hand. 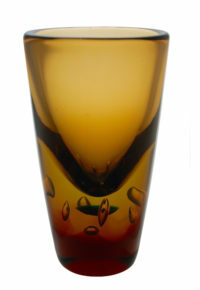 Although it seems fresh and modern, the form is grounded in history, being based on Georgian wine glasses, as the small image shown here of a champagne glass from the 1820s shows. The bubble in the stem is another feature taken from glasses of this period. Comfortable to hold, superb to drink from, and a modern take on a historical design, it truly deserves to be part of my ‘Top Ten’, and as I sip from its delicately blown bowl, it suddenly becomes my No.1 again! Images courtesy of Miller’s and Mark Hill Publishing Ltd, and taken by Graham Rae, www.graham-rae.co.uk. First published in Collect It! magazine.